On the North Side of Fish Rock Gulch, in turn-of-the-century Fish Rock, Dave Berry, Jr. was fixing up his dad’s tiny grocery. Standing on the porch roof, he hauled up a wooden, hand-carved anchor and mounted it to the top of the facade. Below it he nailed a freshly painted sign that read, Anchor Bay Store. The name seemed appropriate because the few huddled and crumbling town buildings were intimately tied to the ships that anchored nearby. From where he stood he could look across the narrow dirt road and beyond the blufftop to where several steam schooners swayed in the protection of Haven’s Anchorage. The ships sailed from San Francisco with hard-to-get items ordered by the local folks, and of course, among the cargo were goods for Barry’s store. They came, though, for the wood products cut from the surrounding forest — sawn lumber, tanbark, and “split stuff” like fence posts, rails, roof shakes, and railroad ties. These vessels were the main link to civilization as the coast road had not yet developed beyond a deeply rutted wagon track between farms and mill sites. It was around the shipping that Fish Rock grew up and sustained itself. 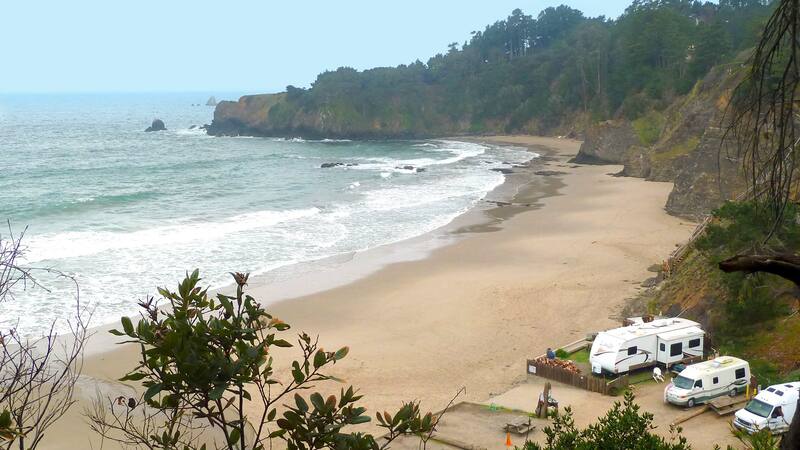 California’s north coast, however, did not make it easy for the original white settlers to get established. The nearly-unbroken cliff, running from the Russian River to the Oregon border, was a geologic wall. With no natural harbors or places to safely anchor out of the typically harsh weather — Humboldt Bay and Crescent City were the exceptions — the region was simply passed by. It was barely noted in the earliest explorers’ logs. For 250 years, beginning in 1565, Spain’s Manila trade route brought square-rigged treasure galleons from the Philippines to the Mendocino coast where they turned south and cruised by without landing. The Russians started a colony in 1812 at Fort Ross but they chose the blufftop location a few miles north of today’s Russian River for the defensibility offered by the rugged terrain. As a shipping port they mainly used Bodega Bay, south of where the “wall” begins. They accomplished their coastwise hunting for sea otters using kayaks launched from ships well out from shore. Their other land-based enterprises weren’t very successful, and when they hunted out the otters, they left. It seemed at first that the north coast had little to offer. Fur trappers were disappointed by the sparseness of fur bearing animals, and miners found little of value in the mineral-poor terrain. Reports, however, of the limitless stands of giant redwood trees began to reach San Francisco just at the right moment in history. California’s population was exploding as thousands of fortune-seekers streamed into the gold fields. New cities and towns needed lumber (San Franciscans were constantly rebuilding a city that burned five times in two years). Builders of the trans-continental railroad needed railroad ties by the millions. Ranchers needed fence posts to tame the state’s vast rangelands. Hide processors needed the bark from the tanbark oak for tanning hides. 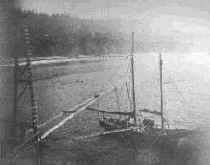 In the extreme demand, the north coast became the focus of a “wood rush.” By the mid 1850’s a saw mill or lumber camp could be found on every stream and promontory along the coast. 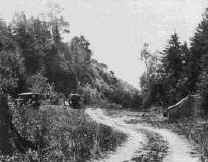 Eager entrepreneurs needed a fast and easy way to get the north coast’s timber to the population centers of the booming state; but in the still-unsettled West, building an access road into the remote coast was a technical impossibility — hills, gullies and gulches plagued the overland approaches. Access had to be by sea. The problem, then, was two-fold. First, getting a ship close enough to the bluffs to be loaded from the land, and second, getting the wood from the blufftop to the ship below. The first problem was solved by the common schooner, the smaller ones being perfect for the job. Being shallow drafted, they could move close to shore over submerged reefs; and being highly maneuverable, they could get in and out of tight spots with relative ease. The second problem of loading was solved with the development of the apron chute. The chute was an adjustable slide that could be lowered to the deck of a ship. Workers on the blufftop slid materials down to the deck hands who packed the ship’s hold until full, then lashed even more above deck. The location of the landings, though, was critical. There had to be a patch of water calm enough, deep enough, and out of the wind for a ship to stand while being loaded, and only certain points of land provided the right sheltering against the elements. Landings — little more than a narrow cranny at times — became known as dogholes as captains grumbled that there was barely enough room for a dog to turn around. But the system worked, and beginning by the early 1850’s, landing operations began popping up all along the coast. Some of the more profitable ventures developed into settlements with stores, schools, churches, and of course, saw mills. There were nearly 50 dogholes along the northern Sonoma and the southern Mendocino coasts. The town of Fish Rock was typical. Still, the coast was an unfriendly place for sail-powered vessels. The prevailing northwesterly winds often reach gale force. Heading out from San Francisco, ships under sail would have to beat their way northward by tacking first toward the west, then east, then west again, sometimes taking days to gain a few miles. When they arrived, a small boat was lowered and lines were rowed out and secured to moorings floating nearby or to bollards on shore. Deck hands hauled on the lines to warp the ship into position below the chute. Lines tied off in several directions kept the ship from shifting about in the surge and wrecking on the unforgiving reefs. Moving a ship into a doghole took skill and alertness. Some were lost to miscalculations. But the real danger was the south/southeaster — the coast’s storm track. The shift in wind direction from the fair-weather northwesterly can happen without warning, and being caught in a doghole at such times meant disaster. Captains kept a weather eye to cut and run when things looked bad. At least 10 ships wrecked at Fish Rock alone before 1900. One of those lost a five-man crew. Perhaps to Dave, Jr., as he climbed down the ladder and surveyed his remodeling job, the future looked bright, but around 1914, the steam schooner Scotia became the last ship to use the Fish Rock chute. The days of the doghole schooner were ending and only a few landings remained. Throughout the era, small towns appeared and disappeared as market demand rose and fell, as competition grew tougher with the introduction of steam power, as forest resources dried up, and as small logging operations were absorbed by larger, more centralized industry. Some small-town folks held on, sustaining themselves with odd jobs, gardens and local barter. Most moved to follow the dollar. In 1924, the elderly Berry, Sr. was killed by his pet bull. Berry’s daughter asked friend and neighbor W. S. Pierce to caretake the store. The Pierce family moved into the house attached to the building, and with a hundred dollars worth of goods, tried their hand at storekeeping. Within that same year, he bought the 240 acre St. Ores place for $3500 which included the lower end of Fish Rock Gulch. The gulch was perfect for camping and fishing access and in 1925 he built a small road down into the site and began charging fifty cents per night to the infrequent traveler. Also within that year Walter Newcomb bought the acreage northward of Fish Rock Gulch which included the old town buildings. He planned to dismantle the crumbling remnants, signaling the end of the old doghole town. Pierce, carrying the name Anchor Bay with him to the south side of the gulch, began to build his own commercial development with the construction of a new store. Within a few years, the unpaved coast road was completed allowing for the odd tourist to venture the twisting 5 1/2 hour drive up from Bodega Bay during good weather. 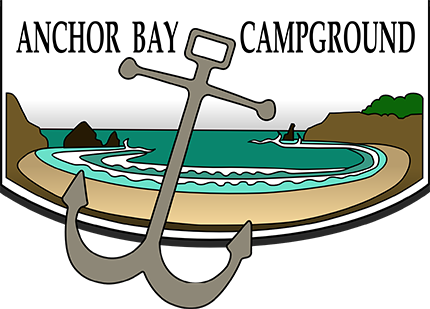 Anchor Bay, beginning as the fanciful name on a tiny store front in a doghole town, had become the placename of one of the coast’s first tourist destinations. The paving of the coast road finally began by 1929. Anchor Bay grew slowly to eventually include not only the store, but also several outbuildings, rental cabins, a restaurant, a gas station, and a dance hall. Although old Fish Rock was typical of the area, the area was not typical of the rest of California. Its ruggedness without natural ports, remoteness without decent roads, gave the “doghole coast” a unique character, a character still felt by those who live here today and by those who venture up the narrow, winding highway to visit these remote places where the redwoods meet the sea.